nobody here but us chickens. : Getting Close to Being Done! Look at these beautiful shelves! Look at them! Mom and Dad were in town and stayed with us this past week. 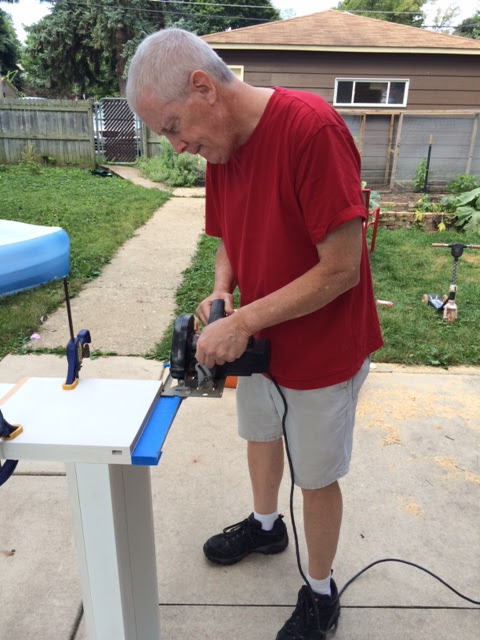 Dad and I spent all week working on the living room bookshelves. Amazingly, we got them up and secured to the walls despite realizing that I made two of the seven sections incorrectly and that my room slants down towards the middle of the house. This causes the right side of the bookshelf to be much higher than the left because the floor is higher on that side of the room. Oh, also, my walls in the living room are plaster and lathe and therefore not flat. At all. So here's what we did to make it work. First, the shelves didn't fit into the dados I had made because the boards were still slightly warped and I had primed them, making the boards slightly too thick to fit. We solved this by sanding the ends of the boards. After that it was pretty simple to glue and nail the shelves together using some pipe clamps to make them nice and tight. Then we had to screw them to one another so that the shelves would work together as one unit. Action shot of Dad and me. We ended up having to cut of an inch or so of the bottom of the right side bookshelf to compensate for the slanted floor. In order to add the bookshelf over the door we had to hold it in place with some boards screwed into the sides of the left and right bookshelves so it wouldn't fall on our heads while we connected them all together. Boy, this post makes the whole thing look so quick and easy! 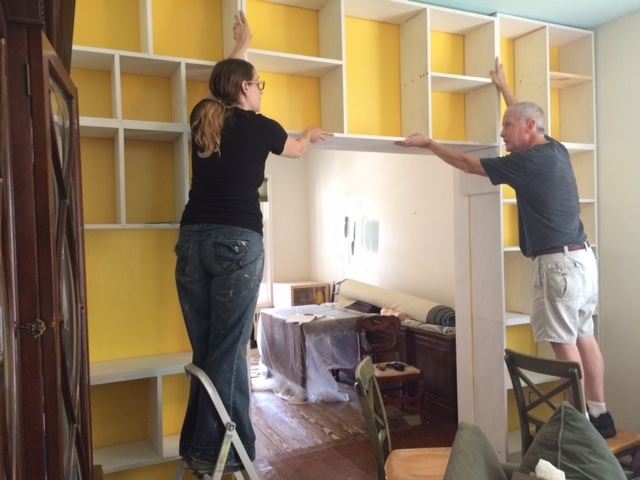 There are still a lot of things that need to be done, including filling in all the nail and screw holes, filling in the gaps between the shelves and the walls on both sides, priming, painting and covering the wonky top with crown molding. But I'm so happy to have gotten this far, which I never would have done without my dad's help. Thanks Dad! Porter Cable Air Compressor I chose this because Dad recommended the company and it was reasonably priced. Plus, it's cute! Wen 18 Gauge 2" Brad Nailer This one got good reviews and was super cheap, my kind of tool!